Instead of a cold start to the day, have a warm and cozy beginning by including a radiant floor heating system in your next remodeling project. Great winter mornings, especially cold days like today, start when your feet hit the warm floor and you look outside at the falling snow! Heated floors offer the best of beauty and comfort. They are energy efficient and cost effective. Installing radiant floor heat keeps you warmer at lower temperatures and cuts down on dust and allergens circulated by forced air heating. 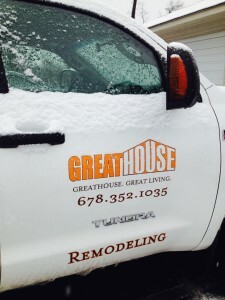 Snow days are good days to think about how take your home from good to GREAT! Call GreatHouse Remodeling today to discuss your remodeling project!